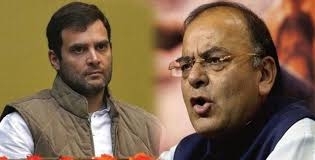 Hours after the Congress party released its manifesto, Finance Minister Arun Jaitley hit out at the grand old party, saying it is “making promises which it can’t fulfill”. Jaitley also said that the party which makes promises it can’t fulfill is not entitled to get even a single vote. Promises like the NYAY scheme are being made out of sheer ignorance by the Congress, said Jaitley. He also mentions in his statement, Congress is diluting and redefining the whole idea of national security. Congress trying to increase taxes while we have cut taxes in the past 5 years. They talk of ammending AFSPA and reviewing it. When people, with an aim to derail the Army investigations against terrorists, register cases against soilders the Congress promises to give them that sanction. There will be cases piling up against the army men in civilian courts.